This past Monday in my private Facebook group we have a weekly Monday Fit Tip and Q&A chat. 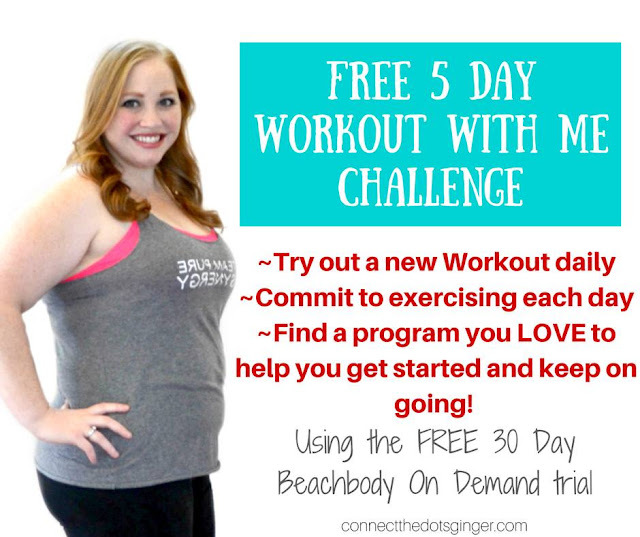 I also shared my FREE challenge for the month that takes place inside that same group! Beginning April 17 we will be running a FREE 5 day WORK OUT WITH ME challenge in the Connect The Dots To Your Healthy, Fitness and Life FREE online support community! Are you having a hard time finding your soulmate workout program? Or just getting that drive to workout daily? Getting started and finding the right workout program is KEY to wanting to stick with exercise. It has to be fun. It has to excite you. And it has to drive you to want to keep working out. The week ofApril 17 for 5 days, you can see what type of exercise you enjoy doing the most to help you find a program you love, stick with it, and get ready for this summer. ~Daily motivation~Daily live video chats with tips on how start a program so you don't stop the next day, getting comfortable with the new moves, overcome struggles with a healthy lifestyle change, listening to your body and other cues and finding that motivation to keep going! To find the motivation and program that keeps you EXCITED and want to continue on your journey! ~At the end of the week I will choose 2 people who participated the most to receive a complimentary copy of my Connect The Dots to your Health Fitness and Life Guide.